Turtle was trundling along in the snow listening to his "learn Japanese with Señor Hedgehog" tape (an altogether confusing but enjoyable experience) when he came across a tiny wooden creature; he was wearing a leaf mask and spreading seeds in the snow. The wooden creature decided to tell Turtle a Japanese tale to aide him in his studies. It was about a tanuki, a shape-shifting raccoon dog and Turtle found it most enthralling. Largely because the tanuki spent the most part of the story transformed into a tea-kettle. Turtle definately likes the idea of shape-shifting but doesn't think that he could possibly choose what he would transform into. He'd maybe just settle for transforming into a tortoise with a shinier shell. When Turtle got home, the story told by the little wooden creature had been playing on his mind and he'd been thinking about just how much he loved teapots. Probably not quite enough to shape-shift into one though, he'd rather the tea stayed in his belly than got poured out for everyone else to enjoy. 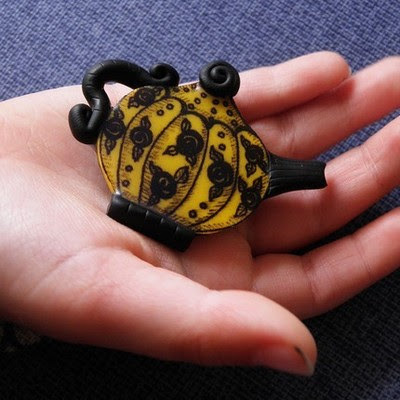 Once Turtle went to a winter garden-party where the theme was tea, he thinks that this brooch would have made a beautiful addition to any lovely ladie's lapel. Luckily it sounds like this isn't the only one that Deborah from Studio Gilead is planning to make. Turtle was inspired by the tanuki story and so found the perfect good bean card to suit. It's one of his favourites and sells it in his Misi and Folksy shop. 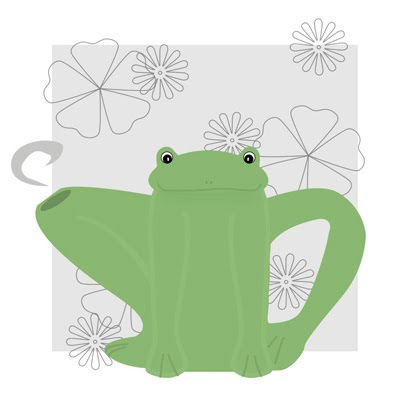 If there ever was a better use for a frog than a teapot, Turtle hasn't heard of it.